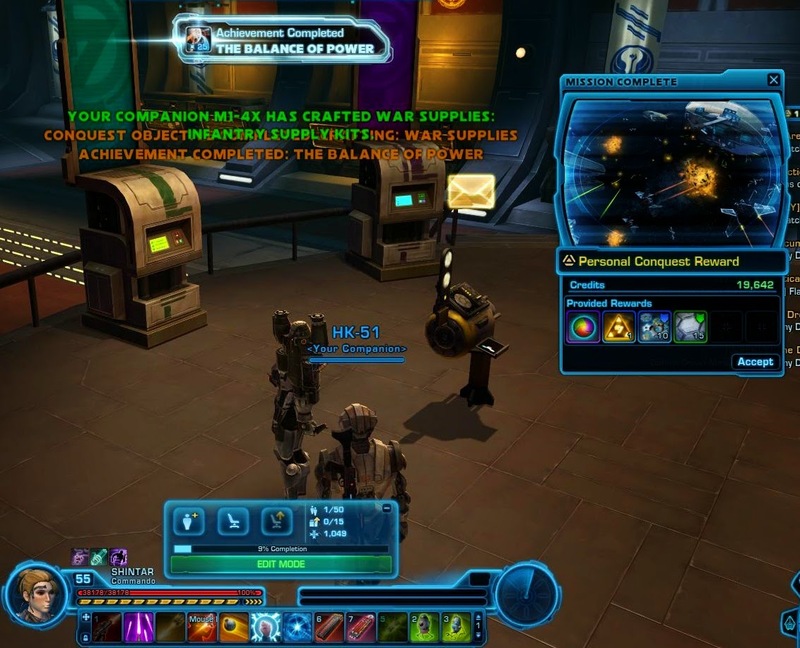 Going Commando | A SWTOR Fan Blog: Conquests - What are they good for? Larry Everett wrote an interesting article describing his own first experience with conquest events on Massively last week. Its core message can be summed up in about three words: "yes but why". 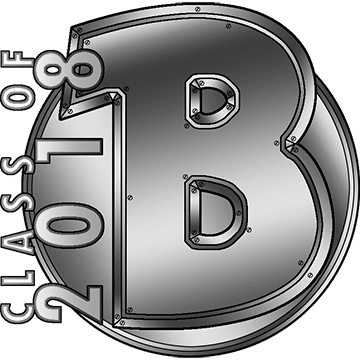 He experienced conquest events as fun, but ultimately not rewarding enough to keep putting in the effort, especially since only the top ten guilds fighting over each planet actually receive tangible rewards. Despite of having been away on holiday, I did get a chance to take part in the first two weeks of conquest - the only problem being that my time to actually achieve anything was cut short by the holiday, so that trying to attain my personal reward on at least one character each week meant cramming a lot of play into a relatively short span of time. My first impression of conquest is that, on a purely personal level, it's a second achievement system with a new coat of paint. It's telling that the pop-ups to inform you that you've completed a conquest objective look exactly like regular achievement pop-ups, which actually caused me some confusion initially. It's kind of as if Bioware suddenly decided to back-pedal in regards to the game's account-wide achievement system, as if they are worried about how it causes the lure of achievements to dry up after a while and in a way that can't be combated by rolling more alts. (You'll still only ever see the "grats on reaching level 10" achievement once.) How do you keep those achievers engaged that have already done everything on their account? Apparently the answer is to give them a secondary achievement system that works on a per-character basis and resets every week. Doesn't matter if the reward for hours of gameplay consists of nothing but a few housing items - the achievement pop-up itself, that feeling of "having done it" is a reward in itself. An achievement for completing pseudo-achievements. Hooray! 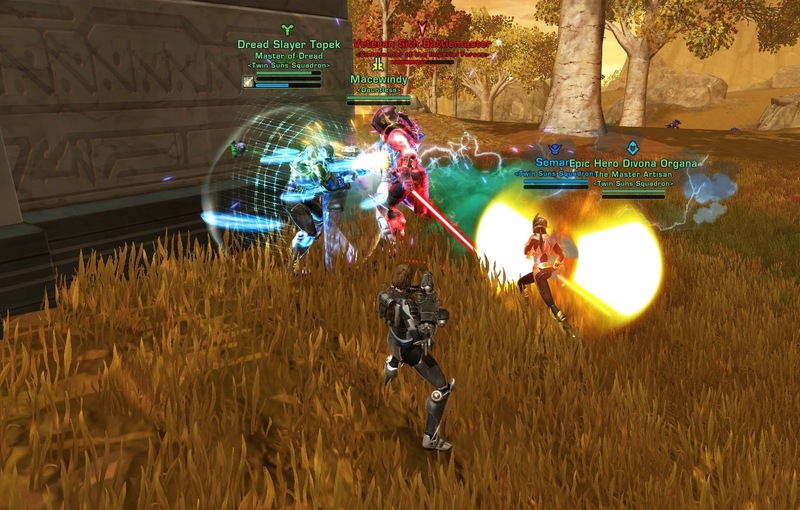 I do worry a little about the PvE-related conquest activities, as their aim seems to be to nudge people towards parts of the game that would benefit from additional player participation instead of simply rewarding people for playing their way. For example you can earn points for doing an operation through the group finder, but not for doing it on a harder difficulty with your guild. I'm not entirely sure how I feel about that. On the one hand I'm always in favour of Bioware trying to keep all kinds of content relevant and running, but on the other hand I worry a little about this being a recipe for burnout, e.g. if you're a hardmode or NiM raider and end up doing things you wouldn't normally do on top of your normal operations just to earn conquest points, especially since some of the rewarded activities can be quite grindy. My pet tank seems to think that it's great that you can earn conquest points from doing low-level heroics and mowing down planetary mobs by the hundreds, but to me that feels kind of tiresome on a max-level character that could usually find "better" things to do. 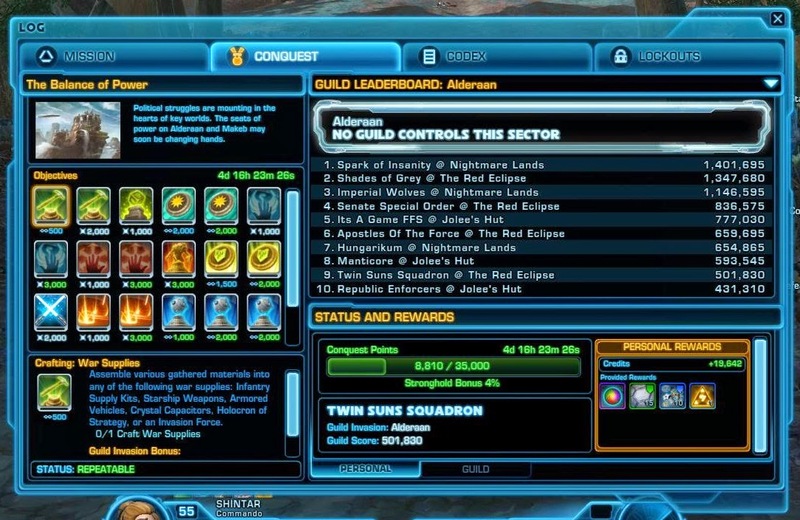 On the second day after release, my guild (Twin Suns Squadron) briefly made it into the Alderaan top ten. Note the names of old, non-existent servers attached to some guilds... makes you wonder about what happened on Bioware's back-end when they performed those server merges back in 2012. On a guild basis I find the conquest system and everything connected to it a lot more intriguing. Sure, part of it is simply grinding out points as a team to try and move your guild up the ranks... but it also genuinely rewards playing together. You need a guild ship to be able to get on the scoreboard, and to improve this guild ship you need to hunt down decorations and kill planetary commanders (or alternatively... spend your time crafting for the next decade or so). There is something warm and fuzzy about running a flashpoint together and then donating the housing items that dropped to the guild bank, to then be able to admire them in your shared space. Feeling like a strike team, we extract an unnamed commander from an Imperial base on Voss (as staying too close to the entrance got us pwned by NPCs). And trying to kill commanders is currently an absolute hoot. I'm guessing that the situation will calm down somewhat once the newness wears off and some people lose interest, but at the moment they are highly contested. 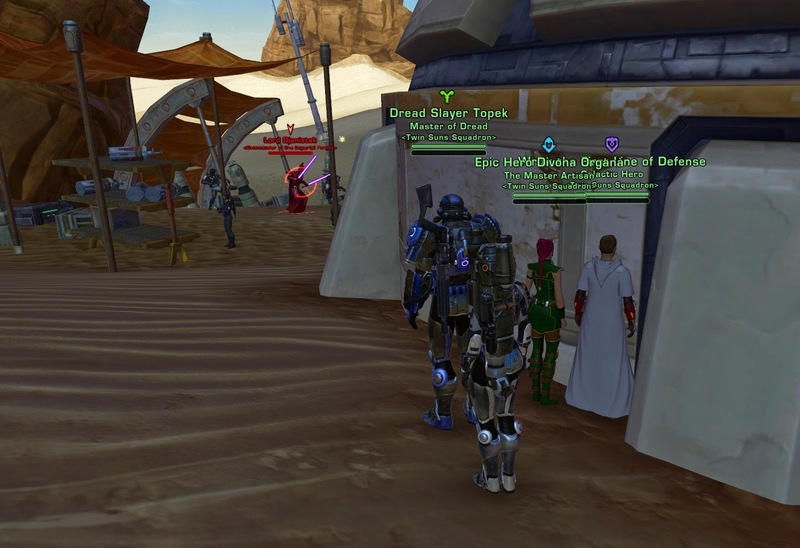 While attacking a commander doesn't automatically flag you for PvP on a PvE server, it does require you to get pretty close to enemy territory, and it's almost inevitable that you end up running into members of the opposite faction and considerable NPC resistance. Once you're brawling with half the base it's pretty much only a matter of time until someone ends up PvP-flagged... and then the real madness begins. Alternatively, if one side absolutely refuses to get flagged for PvP, you can engage in a fun little game of outhealing the raid's damage on the commander to keep him alive indefinitely. Been there, done that! What can I say, I've always had a soft spot for the mayhem of competing for world bosses, even if I sometimes get annoyed by people's methods. I think that the conquest system is a solid addition to the game and brings with it the potential for a lot of fun. I don't think that it needs amazing rewards either - just seeing your name on that leaderboard is reward enough in my opinion. We'll see how things pan out in the long term though. Sometimes I wonder if a great part of a dev's job is simply to give the players a excuse to group up. Like they won't group up just to have fun. But even a small reason is enough to get people to group. Oh definitely. Just like in real life, even social people don't generally socialise by randomly standing around and talking on the street. They'll use excuses like "going to the pub" to see their friends. A good MMO provides a similar sort of space. Having done quite a few KDY runs with guildmates by building a four-player team and then queueing for KDY, I wonder whether the game would give you credit for assembling a full group for an operation and, instead of just entering it, queuing for it in the group finder; I don't know whether the group leader can set an increased difficulty and have it pass through the group finder, or whether it defaults back to SM. If the group finder lets you queue a pre-assembled group at higher difficulties and still have it qualify as "queueing through the group finder", it would make getting credit for it a little more annoying, but it would address your concerns about the disconnect. You can definitely queue as a full group for operations too (we've done it) and get credit for it, but the difficulty is fixed on story mode.